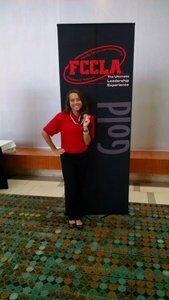 Madeline Bates attended the FCCLA National Leadership Conference, which was held in Nashville, TN, July 2-6. She earned a gold medal for her Entrepreneurship project and came in 4th place in the U.S.! Congratulations to RHS Junior, Madeline Bates!